Dubbya Eyh – These Two Eyes! These two eyes have expanded. They’re growing wider and wiser. They’ve stretched themselves up and down the east coast, along the southern states and finally made it out west. Hello Western Australia, commonly referred to as WA or more accurately pronounced ‘dubbya eyh’. For some reason though I had ignored all of my own first-rate advice. In fact, it didn’t even register for me until after I boarded the plane that I was embarking on a 5 hour flight and spending 10 days across the country. Slipper socks – fail. Inflatable neck pillow – fail. Camera charger – fail. On my way to the Perth City YHA hostel my taxi driver chatted to me about Perth. “You’ll talk to everyone around here. Actually, everyone will want to talk to you whether you want to talk or not.” That’s the perception about out west. The population is scarce, and backwards, and slow, and friendly. But that’s about it. Or so they say. 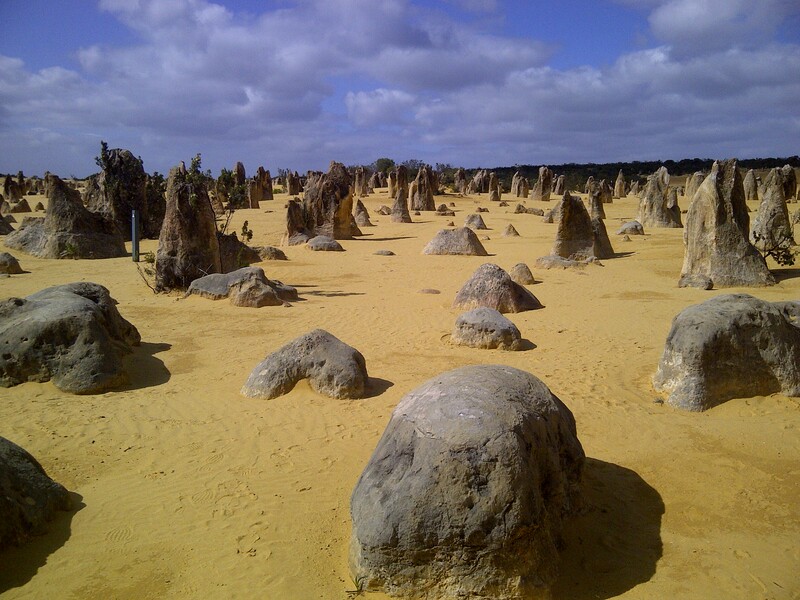 I joined Pinnacles Tours for a full day adventure outside of the city of Perth, heading north into the vast emptiness. This is what I had pictured rural Australia to look like. Driving through the bush, our bus rumbling over flat orange-colored dusted roads, miles of nothingness, no cars in sight, no street lights or intersections, just random clusters of yellow flowers hugging the way. 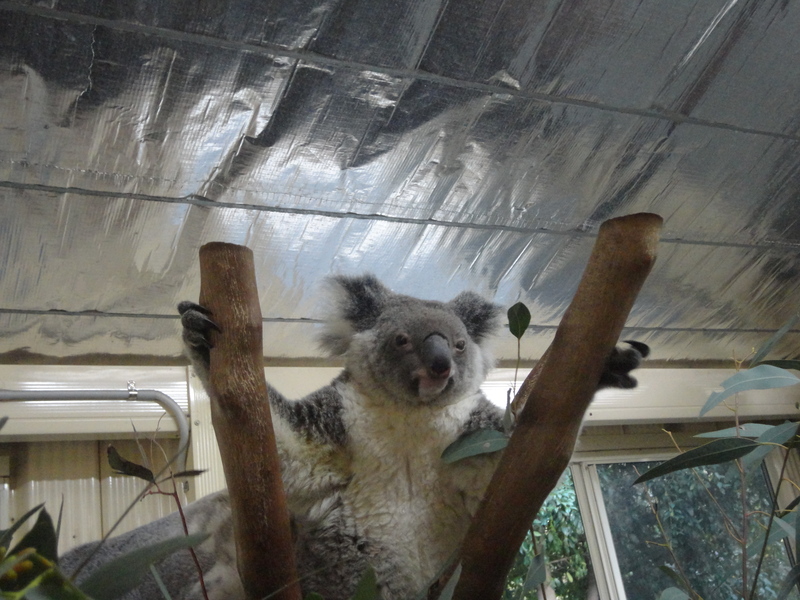 Our first stop was to Caversham Wildlife Park. 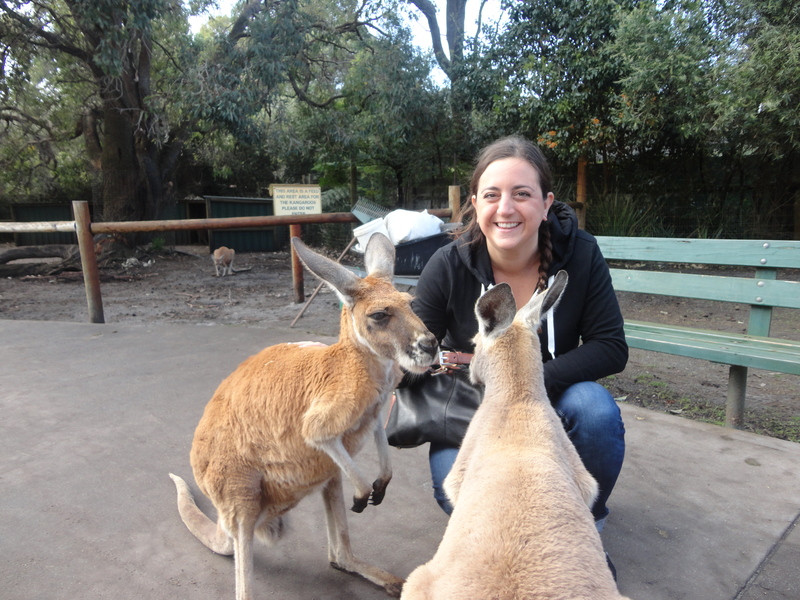 As with most tours, no itinerary would be complete without feeding a kangaroo and giving a koala a light pat. So as you do, I did. But this time around I experienced two firsts. 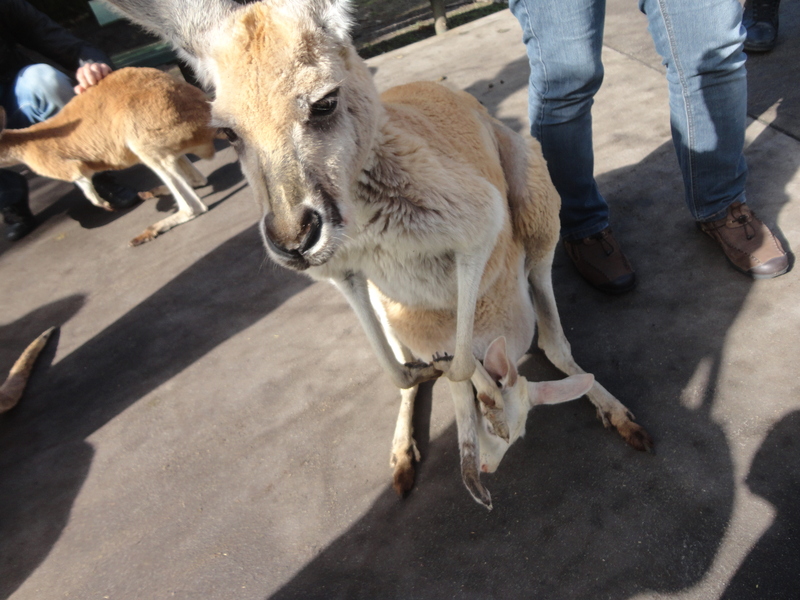 I actually saw a little Joey inside a mama kangaroo’s pouch. And although that sounds all cute and cuddly and picturesque, it really was quite awkward. Poor little guy just had one leg sticking out and was sort of in there upside down. To each their own I guess. 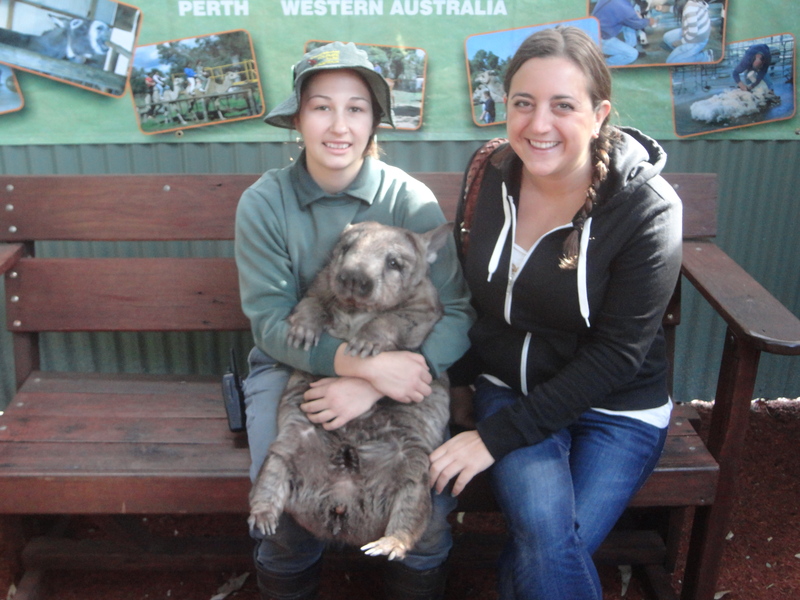 The other first was that I pet a southern hairy nose wombat. But then, that’s when my camera died. On our way to Nambung National Park and Cervantes, we passed wind farms that sustain the local area’s electricity. For a moment in time I could have been in the Netherlands. 50 windmills source 55,000 homes. Pretty impressive. 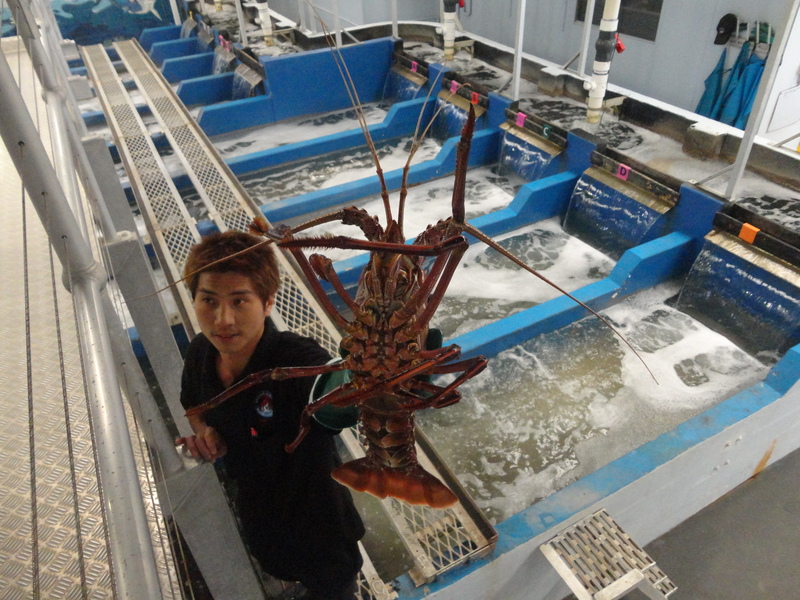 The quant fishing village of Cervantes is home to the Indian Ocean Rock Lobster Factory. Technically, these lobsters are crayfish, but called lobsters because that’s what they’re more commonly known and appeal to the desirable export locations. Cray cray. At first I thought the notion of going on a tour of the facility was quite silly, who cares, but I walked out of there completely fascinated (and hungry!). 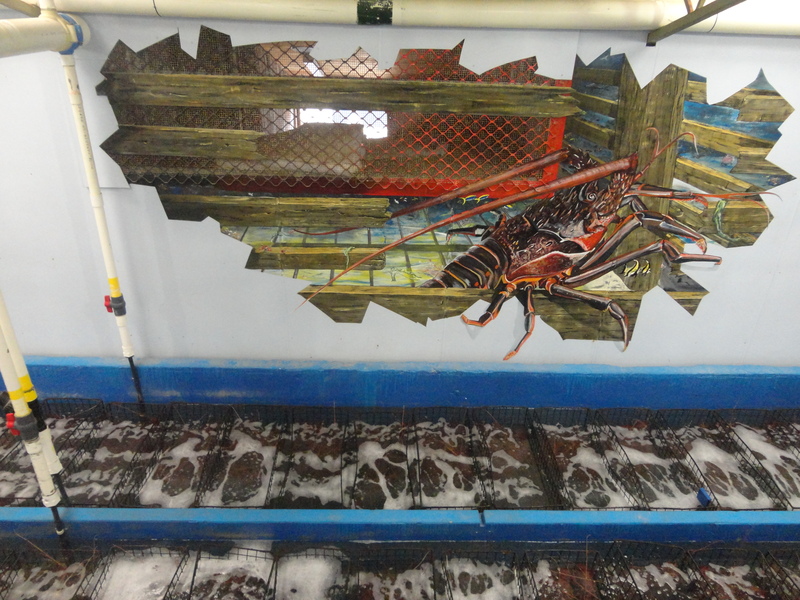 It was interesting to see how the lobsters are chosen, sized and then packed live for shipping. Over an audio tour I learned how first they sort them in long containers based on size, as orders come in requesting certain specifications. They starve them so they remove all of the poo, as they can survive for 30 hours without eating, then whisk them off to be packed after checking to make sure all their legs are still intact. A quick dip in freezing cold water stuns them long enough to be packed in a crate with wood chips and shipped overseas. Visitors can then dine at The Lobster Shack or nibble off the tours supplied lunch that was very unimpressive and underwhelming. I should have paid the extra $30 for the lobster. 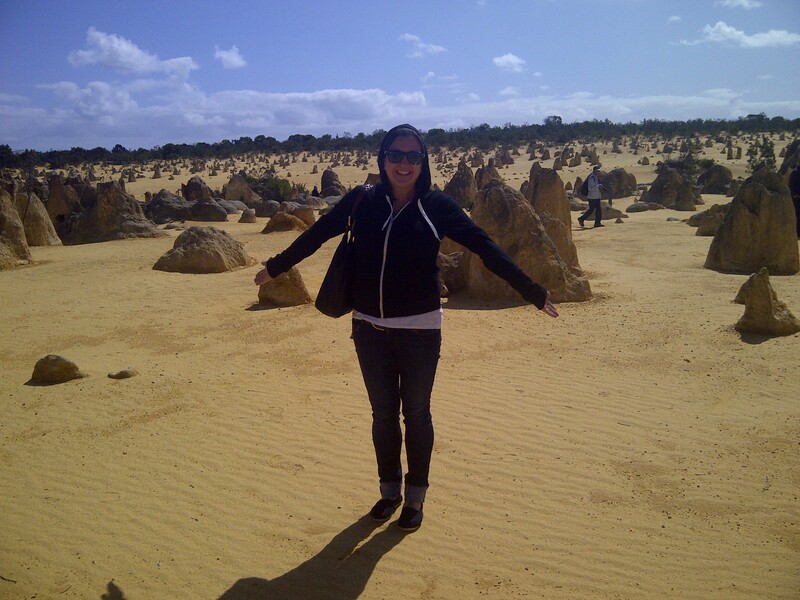 About 250 kilometers northeast of Perth lay Nambung National Park, and the Pinnacles Desert. This is what I’ve been waiting for! Sand dunes more or less comprising of calcified plants and trees that formed crazy looking limestone formations sticking out of the earth, a zillion times over. Breathtaking is an understatement, mesmerizing is more like it. To me, this represented the true desert in my mind. Rock structures of all shapes and sizes extending for miles. The cold wind blowing against my ear, the fine grains of sand into my eyes and the fresh air abundant. There were tourists, but not a ridiculous amount. You could easily walk a few feet in one direction and have nothingness stretched out in front of you. The Indian Ocean resting on one side, and endless counts of mounds in every other direction with green shrubbery scattered in between. I wanted to just take a seat to take it all in. I felt like I had been let in on some secret, like I wasn’t supposed to be there. If it wasn’t for the tourists, the only sound was the rush of wind. Traveling on to Lancelin making our way back down south, I saw heaps of animals in the wild. There were kangaroos, cows, horses, sheep but another first, an emu – the largest bird native to Australia. 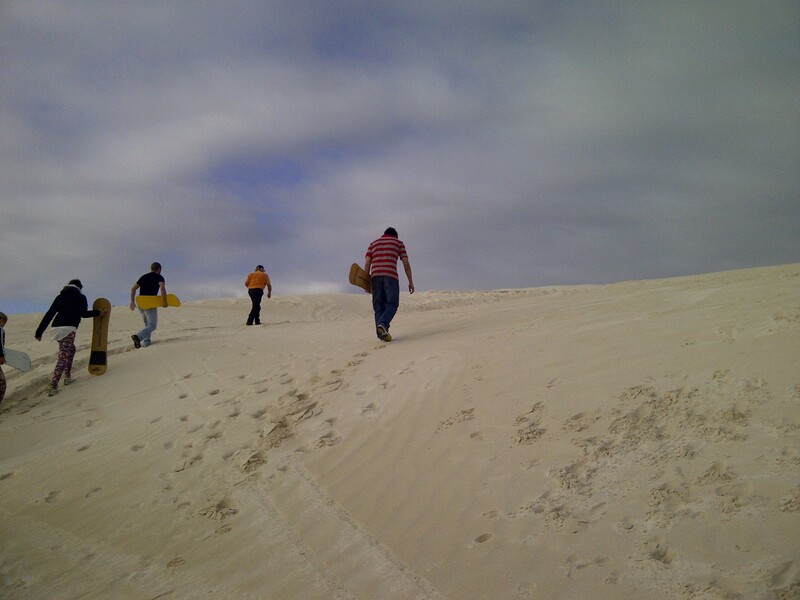 Lancelin is another small fishing village but also a place to explore the massive dunes on four-wheel drive or better yet, taking up the sport of sand boarding. Now, I’ve heard of this being done in the far North of New Zealand which I missed out on, and in Peru, but here was an opportunity right here in Australia. Let’s face it, I was nervous and scared. The dunes were mammoth but all the locals didn’t mind as they casually and expertly glided down. The sand boards provided were the sitting down kind, not the standing up (thank goodness), and so I forced myself to give it a go. Actually, it was quite exhilarating and I attempted one or two more shoddy slides down the substantial hill before taking a spectators seat and offering my board to another. A few hours drive back to Perth and my tour was over. Whew, what a long day. Now, back at the YHA it was about 8 pm and I needed to make a decision – what to do tomorrow? Clearly the only way to decide whether to adventure to Rottnest Island or take a leisure day in Fremantle was to think it over a few pints. Down at Packaz Backpacker Bar within the hostel I made friends with Irish lads Mark and Darren who were over here earning some fine Australian dollars to send back to their families in Ireland. According to them, the YHA was like a hotel. Hmmm. I must have missed something here. The damn Irish, they’re everywhere here in Australia. But at about 1 am it was decided, both! I booked myself on the 8:30 am ferry to Rottnest that cost $92 roundtrip with a return at 2:30 pm dropping me in Fremantle. Done deal. The Rottnest Express was quite an ordeal. The early ferry was crawling with tourists, screaming kids and crying babies and was fully packed. It took about an hour to get to Fremantle to board more passengers, then another 25 minutes to the Island. It was an hour late and I was feeling a bit seedy on the open sea but at least the commentary on board was informative. The ultimate Rottnest experience is to rent a bike and peddle to the little alcoves all over the island to take in some of Australia’s best beaches. Unfortunately for me, the bike line was way too long and I was running short on time so had to travel on foot, which means I didn’t get very far. As soon as I hit land, escaped the tourists and walked along the beach alone, with the sun beaming on my face, my hangover was instantly cleared and a smile was slapped across it. I realized that the silly move of booking the ferry at 1 am wasn’t so silly after all and well worth it. I made it to Thompson Bay and had the whole beach to myself. Then I went for a wander amongst some of the hiking trails, that is until I heard little critters in the bush and started to get freaked out. I came face to face with a furry quokka – a marsupial known to roam the island, and although harmless, told the little bugger to piss right off. 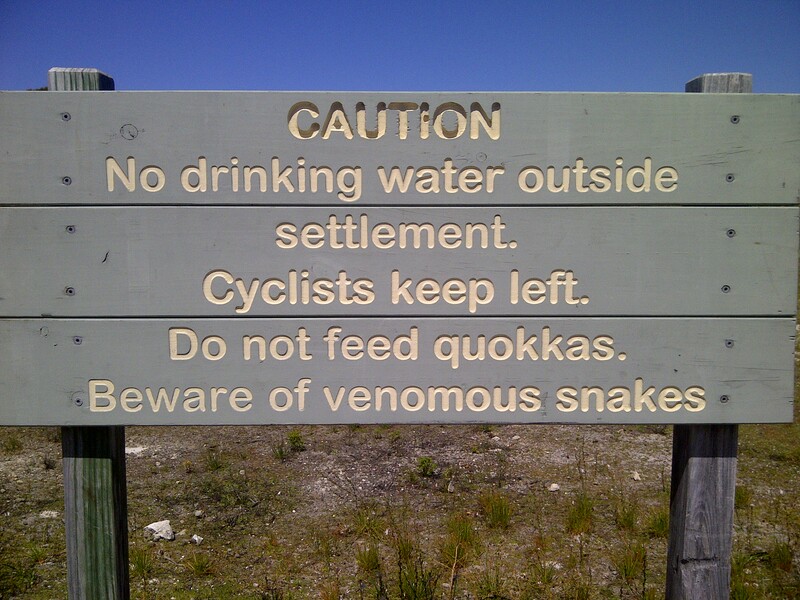 When I came across the sign that read “beware of venomous snakes”, I knew it was time for me to go! In the end, I wish I had more time, and look forward to going back to explore the other beaches, snorkel areas, and hiking trails around the island. Next stop Fremantle or Freo as it’s commonly known as. This is supposed to be the cool place. Everyone in Perth knows Freo is where it’s at. It’s on the water, has great restaurants, history, boutiques and is a university town. I stopped off at E Shed markets, which reminded me a bit of Seattle, although I didn’t purchase anything from the stalls. Home of Little Creatures Brewery, I detoured for a pint of their Pip Squeak Cider for a break in the sun and people watching. They offer free tours at 1, 2 and 3 pm daily but I just missed it. Next I was off to Cicerellos known as WA’s first fish and chip shop. Served in paper and doused in vinegar it brought back nostalgia of my first true fish and chips in the Cotswold’s, England in 1996. This was a good day, and I’m happy! Freo just gave off good vibes. In the green patch of the Esplanade children played cricket, families had picnics, and all the locals were enjoying the outdoors. I stumbled upon some other markets, some more Irish accents, and then hopped the train back to Perth to meet a colleague. 3 nights I stayed with my welcoming colleague who made her home mine. 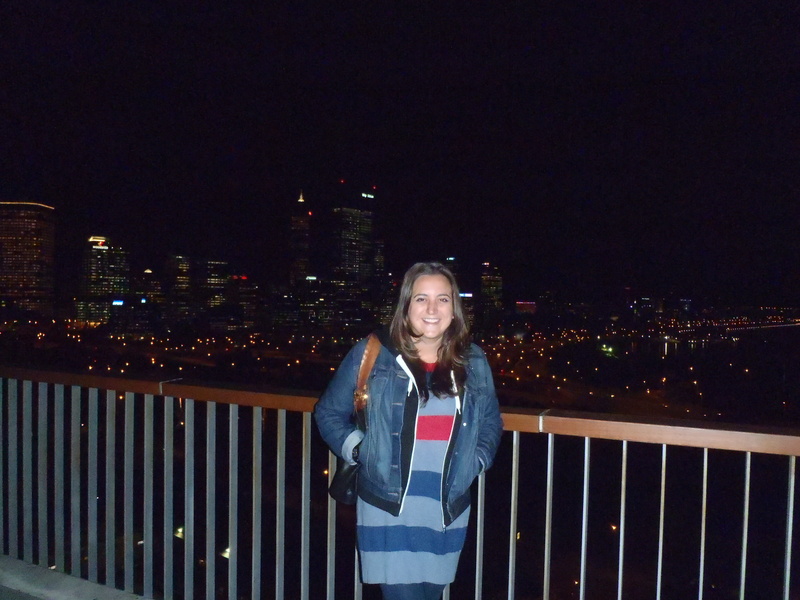 Home cooked meals, washing done, we visited a few local universities and toured some other sites like Kings Park ,which is bigger than Central Park, and sits above the beautiful Perth skyline lit up at night. I then moved on to Kings Perth Hotel in the center of the city, do not stay here it’s disgusting, yet was the only hotel in town that didn’t cost $400 a night, while attending a conference for the next few days. i see you got a jean jacket!